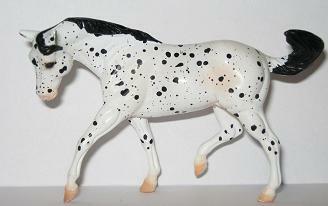 SR 1998 JAH black leopard Appaloosa, of the"JAH Special Edition Stablemates Gift Set", 5000 made. The second generation of Stablemates were introduced in 1998 by Breyer Reeves, Inc. with the exception of 4 foals that were introduced in 2000. 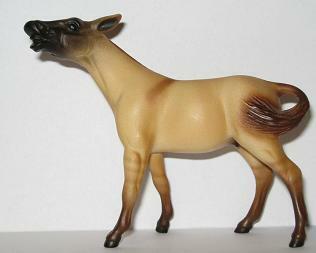 All the photos on this page are part of the Special Edition Stablemates Gift Set. 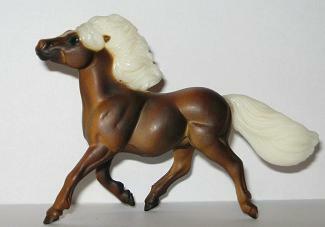 Kathleen Moody was the sculptor of the 12 new adult Stablemate molds that were all made of acrylonitrile-butadiene-styrene copolymer, or "ABS plastic", otherwise known as the "new plastic", which all Stablemates are now made of. The second generation of adult Stablemate molds were the American Saddlebred, Andalusian, Appaloosa (aka "Stock Horse mold"), Arabian (rearing), Clydesdale (aka "G2 Drafter"), Morgan (prancing), Mule, Paso Fino, Shetland Pony, Standardbred, Thoroughbred and Warmblood. In 2000, the Cantering Foal, Scrambling Foal, Scratching Foal and Trotting Foal were sculpted by Sarah Rose and introduced to the public. Thanks to Susan Greystone for her photos!